SAP Fiori Launchpad for SAP S/4HANA Cloud is a role-based, personalized, real-time, and contextual aggregation point for business applications and analytics. It is where users initiate their SAP Fiori apps and acts as the main home page where you can organize additional apps, adapt the user interface, and change the look and feel to suit your daily work environment. In order to move closer to a full self-service user interface, SAP S/4HANA Cloud is unveiling a new functionality in the 1711 Cloud Release where you can create your own Custom App Tile. Now what can you accomplish with this Custom App Tile? You can link URLs such as a side-by-side extensibility application hosted on SAP Cloud Platform. This allows business users to easily access side-by-side extension from within SAP S/4HANA Cloud. Or you may add your favorite news site or your SuccessFactors Performance and Goals quick link at the convenience of your Fiori Launchpad. What user permission do you need to have access to this Custom Tiles App? The user must have been assigned to the SAP_BCR_CORE_EXT (Extensibility) business role. What is the procedure to create a link? 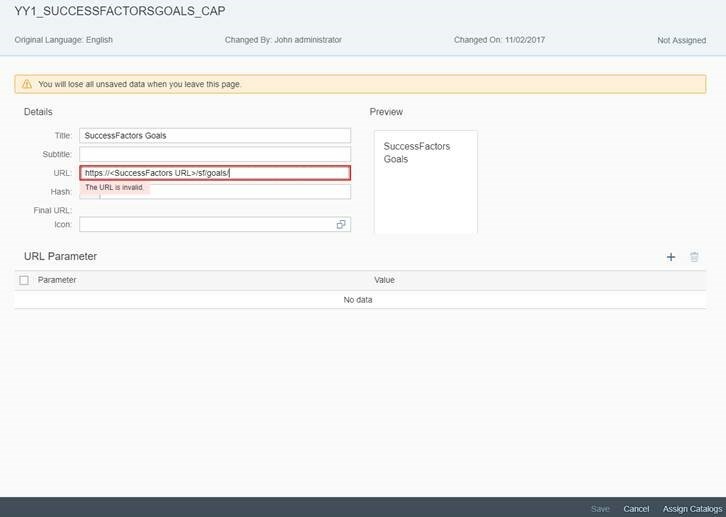 • Log on to the SAP Fiori launchpad in the SAP S/4HANA Cloud system. • Go to the Extensibility tile group and choose the Custom Tiles app. 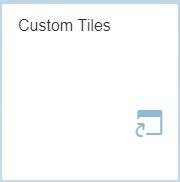 • Click on “New” to create a new custom tile. • On the Create Tile dialog box, type in a title and an ID. The ID is automatically created while you insert your title but it can be customized..
• Click on the “Create” button. On the Custom Tiles Details screen, you can maintain more details, for example, subtitle and icon [Figure 3]. Make sure you have the URL (e.g. the URL of the internal app from the SAP Cloud Platform) maintained properly, i.e. with http* in front. For additional SuccessFactors links, go check out the SuccessFactors Deep Links here. To know more about the details of Custom Tiles app, please refer to the scope items 1RW Side-by-Side Extensibility or 1N9 Key User Extensibility. The scope item 1RW Side-by-Side Extensibility for SAP S/4HANA Cloud provides an overview about extension options in general and a detailed step-by-step guide based on sample scenarios on how to develop an extension application on the SAP Cloud Platform while 1N9 Key User Extensibility offers the means to adapt the UI layout and context, create custom fields and tables, create and extend analytical reports and forms, change and add to the business logic and other additional functionalities to extend your environment. Choose “Assign Catalogs” to determine where you want your custom tile to show up. • In the Add Business Catalog dialog box, select the catalogs of your choice, for example, the HCM – Employee Self Service business catalog (SAP_HCM_BC_EMP_PC) and choose “Ok”. On the Custom Catalog Extensions screen in the Used in Business Catalog section, the added catalog has the status Unpublished. Select the checkbox of the catalog(s) and choose “Publish”. Click “Ok” in the Confirmation dialog box. The status will change to Publishing. It may need some time for the status to show Published. Go back to the Launchpad and once the tile has been published successfully, you will find the tile in the group where you added it, e.g. in the HCM – Employee Self Service catalog. Clicking the tile should take you the page you maintained before. It is opened in another tab. Now that you know how to utilize the new Custom Tiles App feature, you can easily organize your daily work routine and move closer to a more self-service environment. Previous It’s the end of 2017 and where is Employee Central Time Management?